Assistant Professor of Arabic; Director, Middle Eastern Studies. B.A., American University in Cairo; M.A., M.Phil., Ph.D., Columbia University. Articles, chapters, and reviews in Arab Studies Journal, Art Journal, Journal of Visual Culture, Middle East Studies Association Bulletin, others. 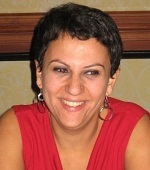 Founding member and secretary, Association for Modern and Contemporary Art of the Arab World, Iran, and Turkey. At Bard since 2010.